Dawn E. Clark's Gifts for the Soul is an intriguing self-help book, full of promise and hope for a new way to engage in self-healing and what the author calls soul healing through soul retrieval work. 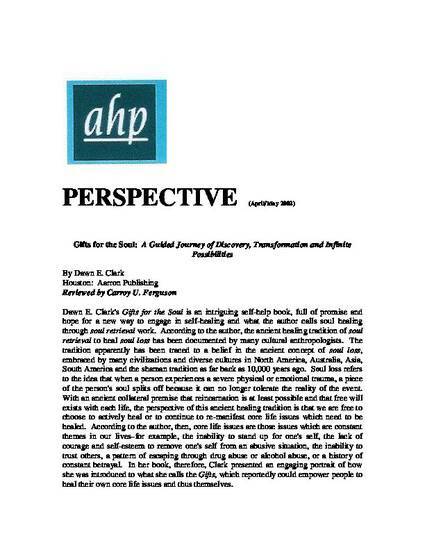 According to the author, the ancient healing tradition of soul retrieval to heal soul loss has been documented by many cultural anthropologists. The tradition apparently has been traced to a belief in the ancient concept of soul loss, embraced by many civilizations and diverse cultures in North America, Australia, Asia, South America and the shaman tradition as far back as 10,000 years ago. Soul loss refers to the idea that when a person experiences a severe physical or emotional trauma, a piece of the person's soul splits off because it can no longer tolerate the reality of the event. With an ancient collateral premise that reincarnation is at least possible and that free will exists with each life, the perspective of this ancient healing tradition is that we are free to choose to actively heal or to continue to re-manifest core life issues which need to be healed. According to the author, then, core life issues are those issues which are constant themes in our lives–for example, the inability to stand up for one's self, the lack of courage and self-esteem to remove one's self from an abusive situation, the inability to trust others, a pattern of escaping through drug abuse or alcohol abuse, or a history of constant betrayal. In her book, therefore, Clark presented an engaging portrait of how she was introduced to what she calls the Gifts, which reportedly could empower people to heal their own core life issues and thus themselves.